I’ve seen a lot of recipes online for overnight oatmeal, but I think mine (or my husband’s, more accurately) is the best. Rather than just refrigerate the oats and milk overnight, we add a small amount of fermented liquid—we use homemade yogurt whey or kefir—and then leave the oats at room temperature overnight. In the morning, we have a slightly fermented bowl of oatmeal, another source of probiotics in our diet. To add a little flavor and extra nutrients, we top our overnight oatmeal with a mixture of chopped walnuts, almonds, dried cranberries and cinnamon. Cover with a small plate and set aside on the kitchen counter overnight, or for at least 8 hours. Don’t let the oatmeal ferment for more than 12 hours, or it will take on a slightly sour taste and a more curd-like texture. In the morning, I microwave the oatmeal for about 1 minute, and then top with a rounded tablespoon of chopped nuts and dried cranberries, and a dash of cinnamon. I like the old-fashioned oats because of their texture, but you could substitute steel-cut oats instead. I also use whole milk, but other milks (even almond or coconut milk) could be used. A bowl of overnight oatmeal with milk and nuts is not only low-calorie, low-fat and low-sodium (about 250 calories), but it’s a good source of soluble fiber, calcium, magnesium, iron and protein. Many of the overnight oatmeal recipes I see on the internet add a lot of extra carbs: sugar, sliced fruit, peanut butter, chocolate chips and even apple pie filling. Some of these actually sound pretty delicious, but be careful about adding too many extra carbs. There is mounting evidence that diets high in carbs—even good carbs like fruit—are just as bad for us as diets high in fat. Breakfast should be tasty, or course, but let common sense rule. 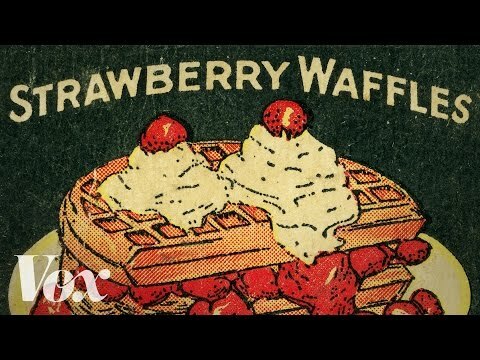 Vox recently posted this video that highlights how breakfast foods we consider “healthy” frequently contain more grams of sugar than dessert. My overnight oatmeal with probiotics is not sweet at all, but that’s what I like about it. Since I started cutting back on extra sugar in my diet, I’ve found my taste buds don’t miss it.